Search Engine Optimisation is an essential element for your website. SEO is an acronym for search engine optimisation. SEO is a key part of any website if you want Google or any other search engine to treat it seriously. SEO is a complex subject, but get the basics right and you’ll have the foundation to move up those search engine results pages. There are many ways to optimise your website as part of your SEO strategy which we would discuss with you after an SEO audit. We only use white hat SEO tactics when looking at an SEO strategy so that Google does not penalise your website. 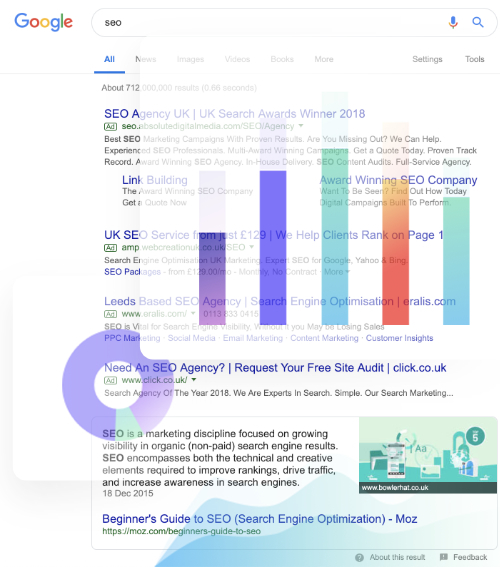 It’s also important to note that Googles algorithms change all the time so anyone who promises that they will get you to the top in a short space of time will no doubt be using black hat SEO tactics. A good SEO strategy is also dependant on the industry you are in, and you are the best person to speak to about your business and area of work. This is why we have to work together to make sure we utilise your industry knowledge. Book our SEO Consultant to conduct an SEO audit and discuss your SEO strategy. Our SEO and Web Optimisation services come under the same pricing as our Web Support Packages. Still unclear about SEO and what it can do for your website?